Eastport Creek is a small, clear creek that drains into Torch Lake, which is the largest inland lake in Michigan by depth and volume, and second largest by surface area (behind Houghton Lake, which is much shallower). Eastport Creek has excellent water quality, especially toward its headwaters. The stream system has two unnamed tributaries. The longest of these tributaries is about four miles long. One branch of Eastport Creek originates in swampy interdrumlin swales, and another in a swampy lake plain near Lake Michigan. A short portion of the stream flows through Antrim County’s Barnes Park, otherwise there is no public land along the stream. The greatest elevation of the Creek’s headwaters is 820 feet. The stream drops 229 feet in elevation, for an average stream gradient of about 57 feet per mile. The stream system is crossed by U.S. 31, Scenic Highway (M-88), and Lore and Ferrel Roads. At M-88, the stream is about six feet wide and six inches deep, with a sand-gravel bottom. Thermal characteristics of the stream indicate that it has moderately-high ground water inputs. Estimated streamflow is about three CFS. The stream water is slightly stained and clear. The stream is located in Banks and Torch Lake Townships (Antrim County). It is shown on the Atwood and Central Lake 7.5 minute U.S.G.S topographic maps. Eastport Creek is designated as a trout stream by the MDNR. 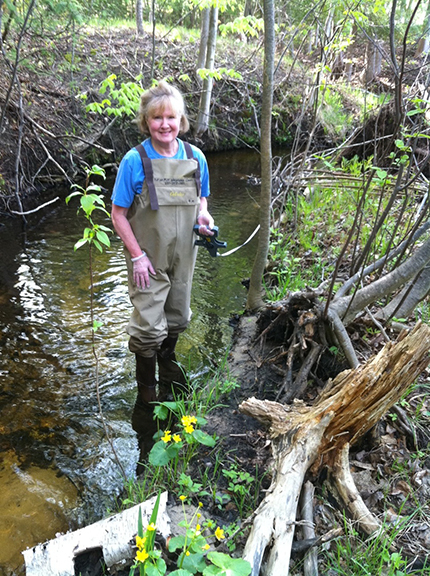 Biological monitoring is performed by volunteers in Eastport Creek each spring and fall as part of the Watershed Council’s Volunteer Stream Monitoring (VSM) Program.